Recently, I told a cancer surviving friend that dogs, nature, and laughter are truly the best medicine. She said to add art and music to the list, and as a lifelong lover of both, I apologized and wholeheartedly agreed. All of these can be enjoyed year round at any age, but it’s hard not to openly admire the annual performance that nature puts on this time of year. 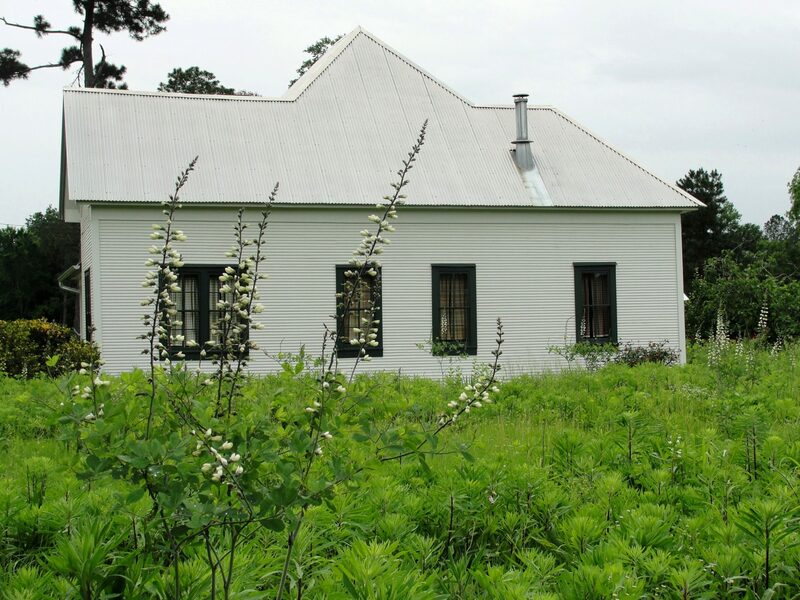 From the beginning of civilization people have marveled and celebrated as fields, forests, and farms came back to life following the bleak, dormant days of winter. I especially like to wander pastures and woods in search of hidden treasures. My grandmother Emanis started that tradition with me and spring wouldn’t be the same without it. Naturally, as a gardener I have my own “pocket prairie” planted with wildflowers rescued from roadsides and hay meadows, where the plants either never get a chance to bloom or don’t get a chance to set seed and multiply. 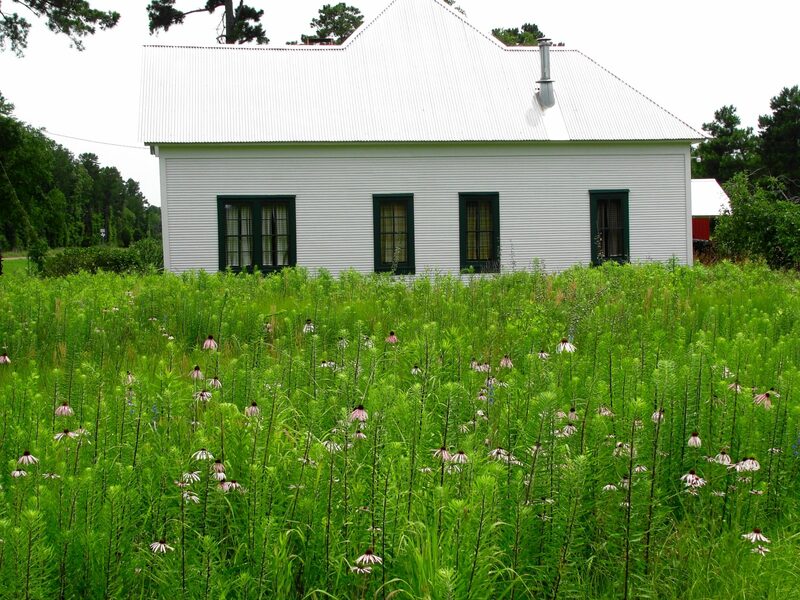 My pocket prairie is just up the road at my paternal great grandparent’s old homeplace that we call “Big Momma’s.” I set aside about ¼ of an acre there, which I bracketed with old iron bedsteads. My dad who lives a bit further up the road calls it my “weed patch” and always wants to mow it for me. One man’s trash certainly is another man’s treasure as I dearly love to watch it change through the seasons. I start out each winter with a controlled burn on the section with the most grasses followed by mowing the rest with the tractor and bush hog. And that’s it. No watering, no spraying, no primping. As more grasses fill back in, the whole thing should burn each winter and I won’t have to do my once a year mowing any more. Without mowing or burning, most East Texas “prairies” and pastures would turn back into forests. I love forests too, but sun loving wildflowers and native grasses need their own space. I burn in the winter because it’s safer, but that eliminates spring blooming winter annuals like bluebonnets from my mix. I particularly cater to warm season perennials that are dormant during the winter. 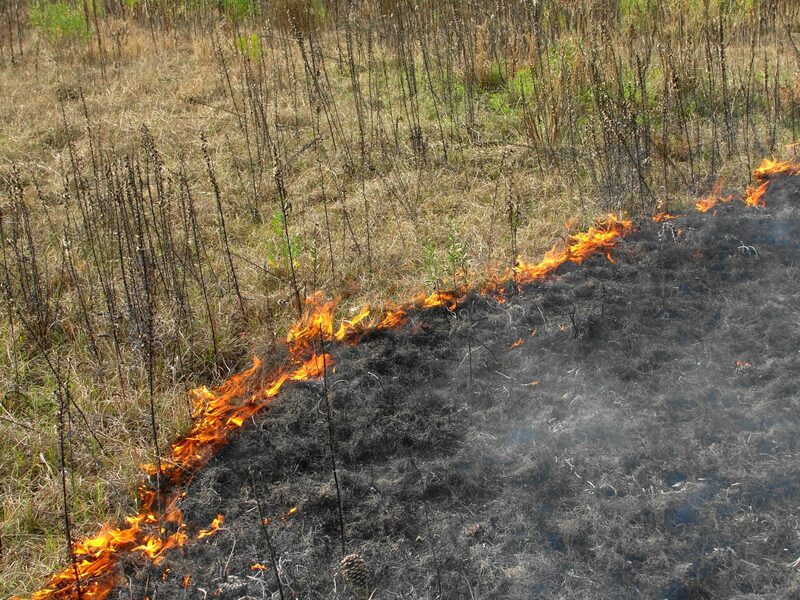 In addition to controlling woody vegetation and allowing bare dirt for seed germination, the burn also acts as an herbicide, eliminating invasive cool season European weeds like ryegrass, vetch, crimson clover, and Queen Anne’s lace. Plus, it makes it look neat and tidy each spring. Uncontrolled wildfires are most definitely a bad thing, but I get tired of hearing folks talk about the fire destroying pasture and ranchland when it actually does the opposite. Grasses, perennials, and sun loving wildflowers not only survive a fire, but sprout back with renewed vigor soon after. Most of the entire southeastern United States evolved in a fire ecosystem, so most pines, grasses, and perennials thrive with regular burns. 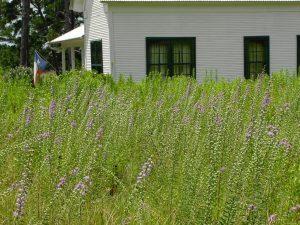 Certainly most people live in places where they can’t burn their pocket prairie, but even in the country I get questions about why I’m “killing” my plants when I’m actually, in a sense, applying a cheap natural herbicide, insecticide, and fertilizer by burning, because those are the effects that I achieve. 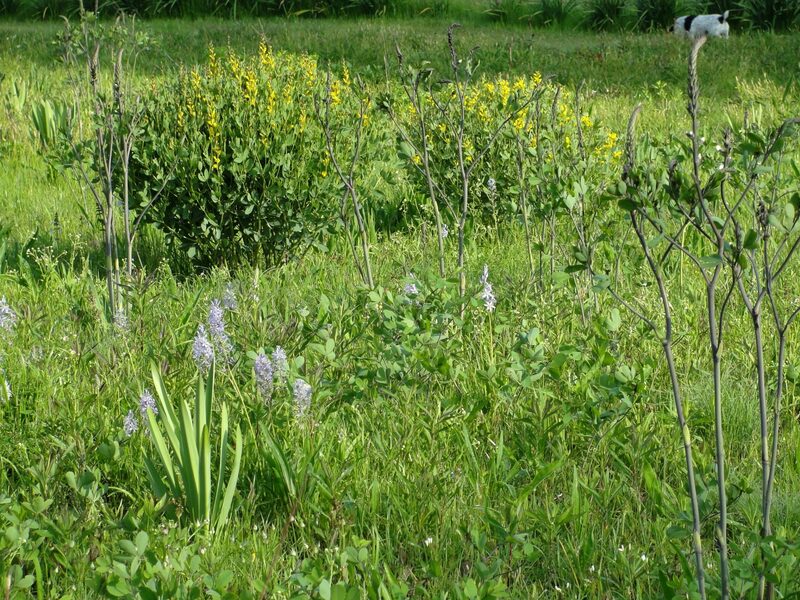 My pocket prairie starts out each year with a show of baptisia or false indigo. Friend Tony Avent at Plant Delights Nursery in North Carolina calls them “red neck lupines” and sells a number of different species and hybrids. 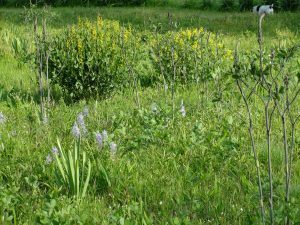 Although the less showy Baptisia nutalliana is common where I live, my pocket prairie mostly sports the less common tall white Baptisia alba and the screaming yellow Baptisia sphaerocarpa. Both are naturalizing nicely with lots of babies coming up. I’m also gradually building up a healthy population of wild blue hyacinths (Camassia scilloides), which I obtained when they put in the asphalt trails at the Pineywoods Native Plant Center in Nacogdoches where I work. It’s normally associated with sunny prairies, so I’m not sure why we have stands of them in the bottomland hardwood forest there. The next wave of flowers is fewer in numbers but dear to my heart, as the drooping pale pink coneflower (Echinacea sanguinea) and Carolina blue larkspur (Delphinium carolinianum) are what inspired me to start the project. Both grow to together in beautiful stands just up the road, but get mowed before they go to seed each year. They mostly cling to existence around utility poles, fence rows, and the edge of the forest. My purple coneflowers are slowly seeding out, but my larkspur has been much slower. I’m not sure if the burn is helping or hurting them. I’ve really never had access to enough seed to get them in the numbers I’d like, but I’ll keep trying. Their flowers are electric blue and spectacular. The burn is certainly helping the Liatris aspera collected along the same road, as it’s reseeding with reckless abandon and attracts good numbers of pipe vine swallowtails and native bees. Heck, all the wildflowers there are attracting great numbers of native bees and butterflies, as they’ve now turned into half the attraction. Another wildflower that’s reseeding nicely is gerardia or false foxglove (Agalinas purpurea). It’s the host plant for the pretty buckeye butterfly. I started with only a few false foxglove and now in a good year thousands appear in the fall including several unusual white ones. The final show is from tall goldenrod (Solidago altissima). There’s too much of it now and it doesn’t burn well. It will gradually diminish in numbers as the grasses and other perennials fill in and suppress it. I prefer my pocket prairie to be waist high not head high! Although goldenrod gets a bad rap for being an allergy plant, it’s not. It’s actually insect-pollinated with heavy pollen that doesn’t float anywhere, much less up someone’s nose. That job belongs to non-showy, wind pollinated plants like ragweed. Always remember that showy plants are showy to attract pollinators to lug their heavy pollen around. Plants with flowers that you can’t see like oaks, cedars, and grasses are the ones that fill the air with pollen in order to find their mates along with our eyes and nostrils. As a lifelong allergy sufferer, I know my pollen! One doesn’t have to have a quarter of an acre to enjoy a pocket prairie or its associated pollinators. Any little patch of flower bed or border will do, no matter how small. I’ve created what I call postage stamp prairies in the past as well as a five acre tall grass prairie. My next project is 20 acres of pollinator plants beneath my eventual longleaf pine savanna.